WOMENS BEARPAW BOETIS CURLY FUR BROWN MONGOLIAN WINTER BOOTS Sz 12. Condition is Pre-owned. Shipped with USPS Priority Mail. folks I have taken plenty of pictures so you can see the condition of these boots. These are used and they do show wesr from age and use. still a really nice food. 100% GENUINE Mongolian Fur RUG. Multi-use rug for: sofa, car seat, chair, floor, bed, souvenir etc. Luxurious look & feel! In this way, you will know the process of your parcel. Size: 55x110cm(21.65"x44.3")(1.8'x3.6'). Mongolian Curly Wool. Tibet Lamb. Super soft curly wool fur. A wonderful silvery grey. Sides & back are rabbit fur. Ladies size XS - S 2~4~6~8. Single front hook closure. Total length 19" long back of neck to bottom hem. Fur clean only. sleeve length is 23 in. Super soft and in great shape, marbles color, not stiff or matted down. length is 25 in. Silk, linen and other natural fabrics can have variances in color. 100% Real Mongolian Lamb Fur Vest. Shipped with USPS Priority Mail. Lamb Sheep Faux Fur vest Jacket Small offwhite American Eagle. Condition is Pre-owned. Excellent condition. No defects or imperfections. smoke Free/pet free environment. Wonderfully soft long Mongolian faux fur curly haired pillows. 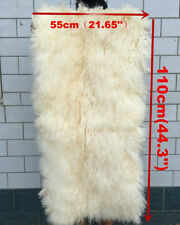 front fur from end to end is approx 20". Material: 100% real mongolian wool. color: Ivory white(It is natural color without deying,there maybe a little different from each other.). Handmade item,there maybe 1-3cm/1"difference,hope you can understand. THE FUR IS FLUFFY, SHINY AND SOFT. THIS SCARF IS VERY FASHIONABLE AS WELL AS PRACTICAL AT KEEPING YOUR NECK WONDERFUL WARM. Button closure with belt. Missing 1 black button. Condition is Pre-owned. BLACK Mongolian Lamb Fur Trim Long Maxi Dress Coat MADELINE by ALORNA. Condition is Pre-owned. Shipped with USPS Priority Mail. Used for display only. 16x16" back, Appears as 18" x 18" on front. New natural Mongolian lamb plate 24" X 48". UP FOR GRABS! A BEAUTIFUL FUN & FUNKY MONGOLIAN TIBETAN LAMB FUR COAT. THIS COAT IS BEAUTIFUL! THE FUR IS BUTTERY SOFT, SUPPLE & FLUFFY! IT IS THE COLOR OF BUTTER, I CALL IT BUTTERCREAM. IT HAS HOOK & EYE CLOSURES, FULLY LINED, LINING IS IN GREAT CONDITION WITH NO MONOGRAM. Women's EXPRESS Suede Leather and Real Mongolian Fur Trim Tan Jacket Size Small. Condition is Pre-owned- has dark wear areas and wear holes on inner lining. Has 90s Penny Lane vibe. Front toe and fully lined. Approximate measurements laying flat: Shoulders- 15.5” Bust- 18” Length- 23” Zoom into photos for more details. Pet and smoke free storage. Please ask questions prior to purchase. Thanks for looking at my listing. Check out my other name brand items. Material: 100% real mongolian wool. Handmade item,there maybe 1-3cm/1"difference,hope you can understand. 1Xmongolian cover(without insert). shape: square. color: Black. Good news! We can customize any color and size. 1 x Pillowcase. Pillow case size: 45cmx45cm (18"x18"). In this way, you will know the process of your parcel.